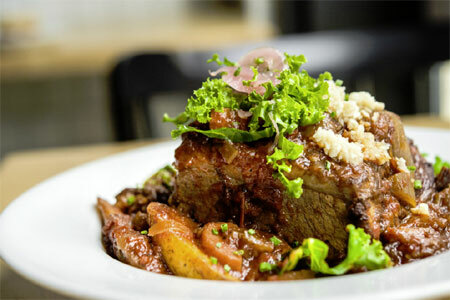 Alsatian and poultry-centric dining in the Flatiron District. : Le Coq Rico features a menu of poultry prepared in a variety of ways, with chicken, squab, duck and guinea fowl sourced from the finest farms in the country and raised to very specific growth and environmental requirements to ensure tenderness and flavor. 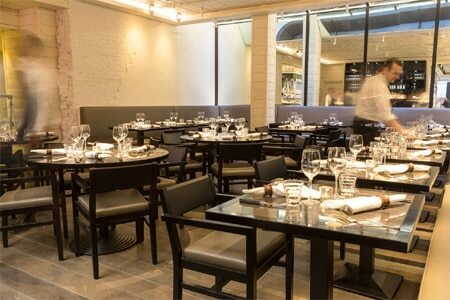 The sleek setting is divided between a long bar area (where the rôtisserie is on full display) and an airy dining room. Wall décor of white feathers and eggs enhances the motif. Start your meal with rich seared chicken liver and a glass of Riesling from the extensive menu of French and New World wines. Entrées are designed to be shared by two to four people: choose rôtisserie-cooked or stuffed birds, a slow-roasted version of the Alsatian baeckeoffe or terrine en croûte with duck foie gras. A selection of “Eggz” adds more poultry-related choices. To finish, the île flottante is a must.